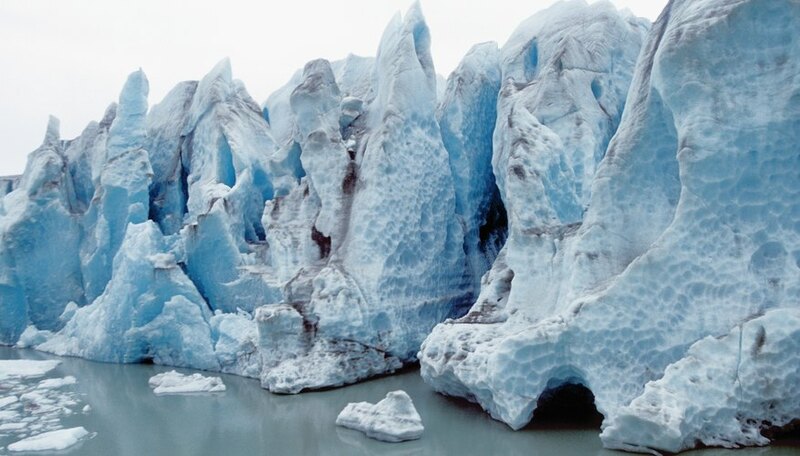 Glaciers are large masses of ice that hold the majority of the Earth's fresh water supply. A continental glacier, or ice sheet, is one type of glacier that spreads in all directions. Another type of glacier is called a valley glacier. These are confined by mountains on each side and can only flow down through a valley. Both types of glacier have tremendous impacts on the surrounding landscape, changing it in various ways as they pass by. One way that glaciers change the landscape is by erosion. As they pass over the ground, the ice scrapes up soil and rock. A valley glacier will leave a valley much deeper, as it erodes the underlying surface with plucking and abrasion. Plucking occurs when large rocks or other objects are pulled out of the earth by the force of the glacier's movement. This feature of glacial movement leaves large and gaping holes behind. When smaller objects are caught in the ice, they rub on the ground as the glacier passes. This process, known as abrasion, can leave grooves in the ground or act like sandpaper and smooth the ground beneath the glacier. After the glacier displaces the soil and rocks, these materials are pushed off to the sides and deposited by the glacier as it passes. There are many different types of these deposits, including moraines and varves. Ground moraines are left under the glacier as it passes, while terminal moraine is material that is pushed forward in front of the glacier to be deposited at the edge as the glacier melts. Finally, a lateral moraine is formed along the sides of the glacier from a combination of erosion and avalanches caused by the glacier's movement through a valley. Glacial varves are deposits that form on the beds of lakes that are fed by glacier melt. The material is caught up in the glacial ice, and then washed downstream as the glacier melts, to deposit into a lake. Tufts University: What Are Glacial Varves? Vee Enne is a U.S. Military Veteran who has been writing professionally since 1993. She writes for Demand Studios in many categories, but prefers health and computer topics. Enne has an associate's degree in information systems, and a bachelor's degree in information technology (IT) from Golden Gate University. What Is a Gorge in Geography? What Is the Difference Between Erosion and Deposition? Enne, Vee. "How Do Glaciers Change the Landscape?" Sciencing, https://sciencing.com/do-glaciers-change-landscape-5127306.html. 24 April 2017. What Happens When a Glacier Melts? What Are Some of the Forces That Change Landforms?